Thanks, Dennis A, for this one. There's some debate about whether the caption is, in fact, intentional or a typo. 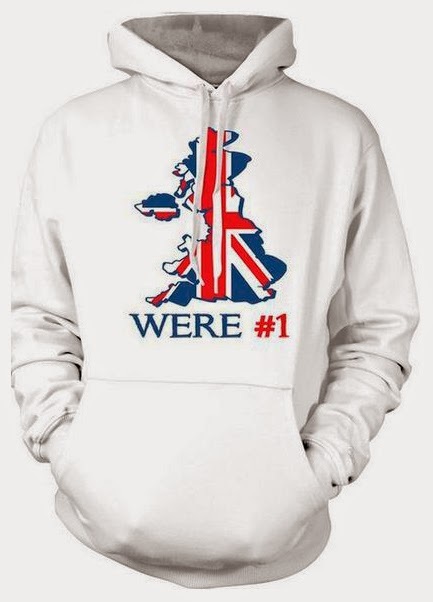 Either we are Number 1 in which case we're definitely not as far as apostrophe placement is concerned. Or we were Number 1, in which case we might have been at one time but we're certainly not now. Either way, it's not particularly good news for the UK. As for the hoodie, where would we wear it? Well, we're wearing it on the weir now but where were we when we were wearing it where we were then? In the warehouse. Which, if there's any justice, is to where these were wares which we were wearing would wend their weary way.